I bought myself a present: the TomTom Multi-Sport Cardio! 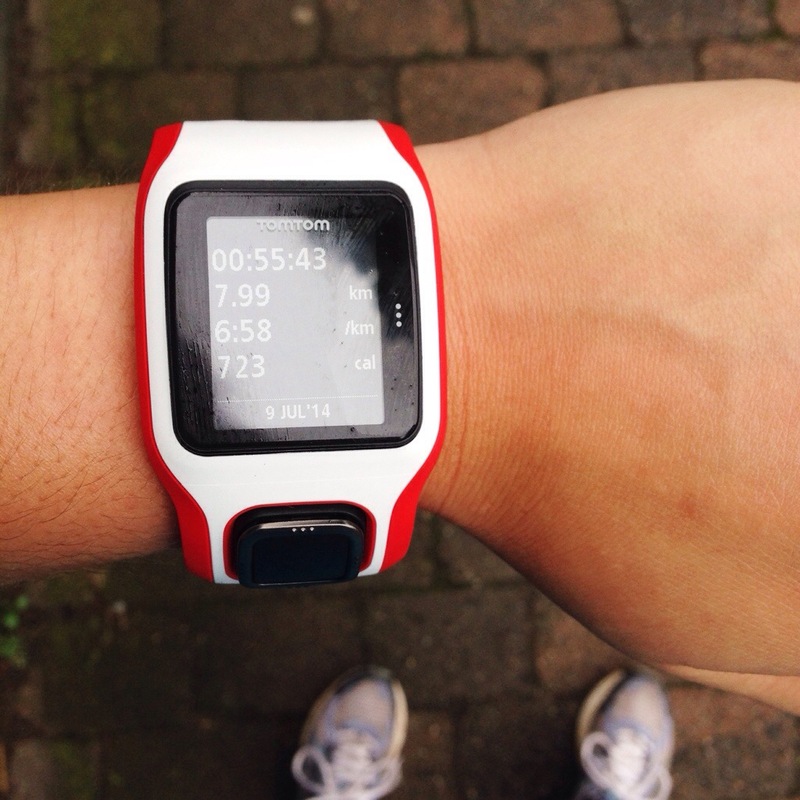 A sports watch with GPS and build-in heartrate function. The Looks. The Multi-Sport Cardio comes in two color combinations: red-black and red-white. I Bought myself the latter one. At first the watch looks quite big, but once on the wrist it was not so bad. The band is quite broad (probably because of the build-in heartrate function), but it makes sure that the watch stays in the right place. The screen is big enough so you can clearly see the info while running and with one touch on the side of the screen you can turn on the backlight of the screen so the info is visible while running in the dark as well. Below the screen is only one square button which works like a ‘joystick’ to navigate through the menu. The watch is delivered with a special strap for adjusting the watch to a bicycle and the watch is waterproof and can be used for swimming as well. Functions. After loading the battery and installing some software you’re good to go! The watch works very easy by navigating through the menu with the square button below the screen, just select the activity that you want to do (running, swimming, cycling, running on a treadmill) . The GPS function worked really quick, it only took a few seconds to find the GPS signal, once found the watch gives a sign that you’re good to go! The GPS-function was very accurate as well, something I think is really important! While running you can use the square button to scroll through the info such as speed, heartrate, heartrate zones, time and distance. It’s possible to select a type of training in advance: aiming for a goal (distance, time or calories burned), interval training (you can choose for time intervals or distance intervals, also a warming-up and cooling-down are included), laps, heartrate zone or you can race against times you’ve ran before. Compatibility. It’s possible to connect the watch to your computer (by cable) or to your phone (by Bluetooth) and to synchronise the data. 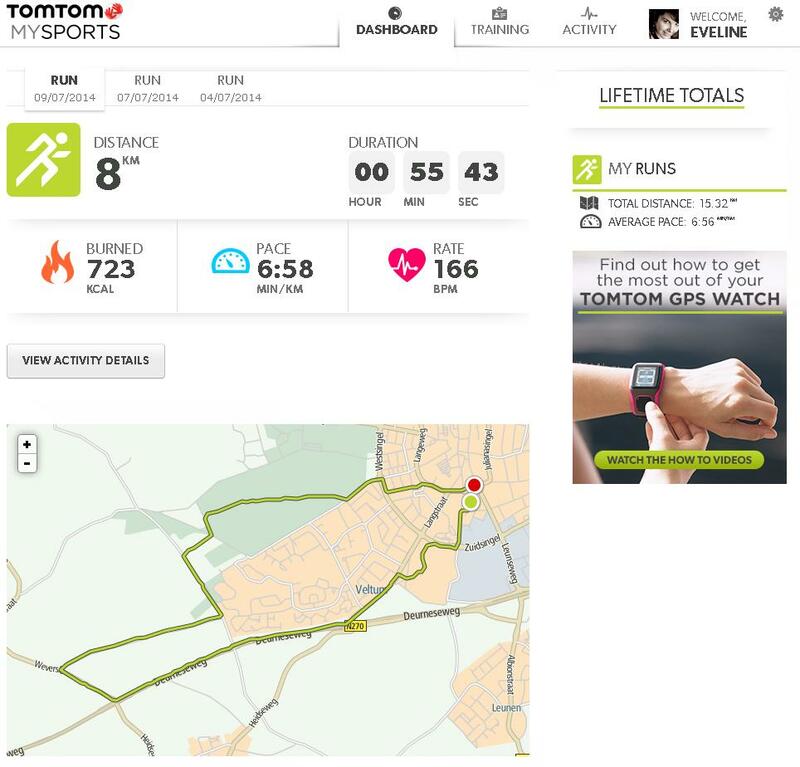 When connecting the watch to your computer the program starts automatically and with only a few clicks on the watch you can connect the watch with your phone and import the data (You’ll need to download the TomTom Sports app). Once you’ve imported the data to the desired medium you can see info such as Route, Speed, Heartrate and calories burned during the workout. It’s possible to share the data with other applications such as MapMyFitness, Strava, Runkeeper and into different file-types for importing to other apps and programs. I like to use Looptijden.nl or Nike+ for example, I can create a file of my latest workouts that I can easily upload to those platforms as well. Conclusion. To me this sports watch has all the functions I wanted and had in mind in advance! I think it’s very pleasant that this watch has a build-in heartrate monitor, in stead of a breast-strap. Very happy with this purchase! Prices from €169,– and up. Was this review helpfull to you? Feel free to share your thoughts in the comments below! Posted in Reviews, SportsTagged food, healthy lifestyle, review, running, sport, sportsBookmark the permalink. Wow, nice! Ik wilde altijd een polar kopen, maar deze ziet er beter uit haha. Duuuur haha, te duur voor mij. 😛 Maar wel nog steeds echt gaaf!